I have a neuroanatomy midterm tomorrow. Why am I blogging? Perhaps because Sheila has seemingly forgotten about the blog and abandoned us all. Auf Wiedersehen. Perhaps because I’m so giddy about going home to Camillus tomorrow for spring break that I can’t focus on the cards I’ve been flashing since Sunday. Or perhaps because I’ve eaten this for dinner four nights this week and it’s time to share the wealth. 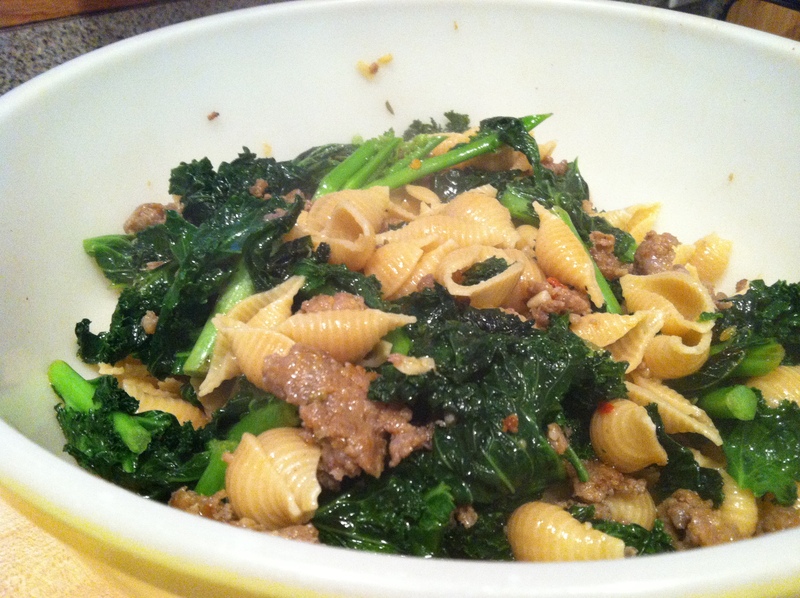 It should be noted that I intended to make this dish with broccoli rabe as per the request of the classy sassy ToriNotes, but I couldn’t find it at The-Grocery-Store-Which-Shall-Not-Be-Named. However, if you shop anywhere else you are free to use broccoli rabe, or any other green, instead of kale. So I made a huge batch Sunday, ate it for dinner that night, Monday and Tuesday. Then I used the rest of the ingredients and made it again tonight. And now I want to lay in a bathtub full of chocolate wahhh. Boil the pasta water. Salt it, and cook pasta according to directions. 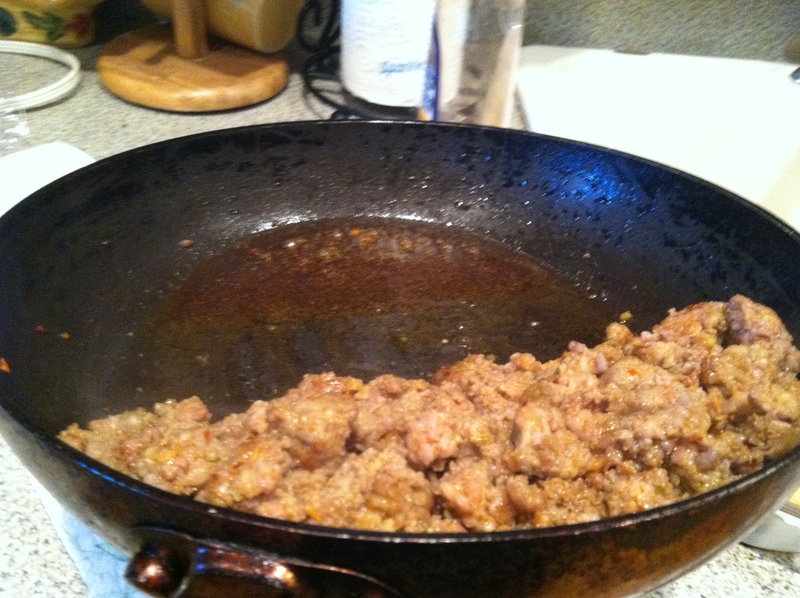 While the pasta is cooking, put about a tablespoon of oil in a frying pan and cook the sausage until brown. Remove from the pan with a slotted spoon and place onto a plate lined with paper towels. Drain some of the fat from the pan, reserving just enough to coat the bottom. 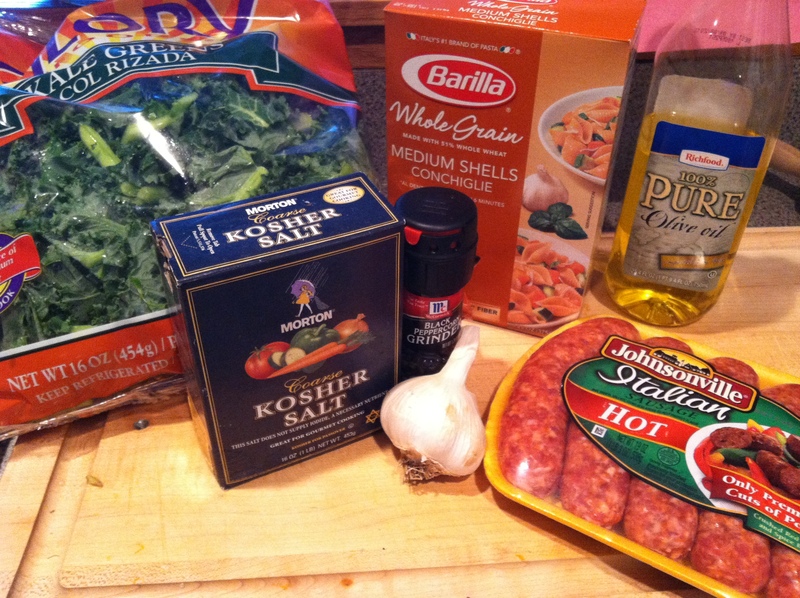 Add the kale and garlic with salt and pepper, and start to cook down. Add a little bit of the pasta water to help it steam. Once everything is cooked, toss it all together. Taste to see if it needs more seasoning. Then make peanut butter oatmeal (chocolate chip) cookies to continue the procrastination process. My hypothalamus is going wild.